As the sophistication of cyber-attacks increases, understanding how to defend critical infrastructure systems—energy production, water, gas, and other vital systems—becomes more important, and heavily mandated. 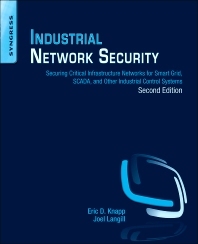 Industrial Network Security, Second Edition arms you with the knowledge you need to understand the vulnerabilities of these distributed supervisory and control systems. The book examines the unique protocols and applications that are the foundation of industrial control systems, and provides clear guidelines for their protection. This how-to guide gives you thorough understanding of the unique challenges facing critical infrastructures, new guidelines and security measures for critical infrastructure protection, knowledge of new and evolving security tools, and pointers on SCADA protocols and security implementation. Joel Langill brings a unique perspective to operational security with over three decades field experience exclusively in industrial automation and control. He has deployed ICS solutions covering most major industry sectors in more than 35 countries encompassing all generations of automated control from pneumatic to cloud-based services. He has been directly involved in automation solutions spanning feasibility, budgeting, front-end engineering design, detailed design, system integration, commissioning, support and legacy system migration. Joel is currently an independent consultant providing a range of services to ICS end-users, system integrators, and governmental agencies worldwide. He works closely with suppliers in both consulting and R&D roles, and has developed a specialized training curriculum focused on applied operational security. Joel founded and maintains the popular ICS security website SCADAhacker.com which offers visitors extensive resources in understanding, evaluating, and securing control systems. He developed a specialized training curriculum that focuses on applied cyber security and defenses for industrial systems. His website and social networks extends to readers in more than 100 countries globally. Joel devotes time to independent research relating to control system security, and regularly blogs on the evaluation and security of control systems. His unique experience and proven capabilities have fostered business relationships with several large industry firms. Joel serves on the Board of Advisors for Scada Fence Ltd., works with venture capital companies in evaluating industrial security start-up firms, and is an ICS research focal point to CERT organizations around the world. He has contributed to multiple books on security, and was the technical editor for “Applied Cyber Security and the Smart Grid”. Joel is a voting member of the ISA99 committee on industrial security for control systems, and was a lead contributor to the ISA99 technical report on the Stuxnet malware. He has published numerous reports on ICS-related campaigns including Heartbleed, Dragonfly, and Black Energy. His certifications include: Certified Ethical Hacker (CEH), Certified Penetration Tester (CPT), Certified SCADA Security Architect (CSSA), and TÜV Functional Safety Engineer (FSEng). Joel has obtained extensive training through the U.S. Dept. of Homeland Security FEMA Emergency Management Institute, having completed ICS-400 on incident command and crisis management. He is a graduate of the University of Illinois–Champaign with a BS (Bronze Tablet) in Electrical Engineering. Has nearly 30 years experience in in-depth, comprehensive industrial control systems architecture, product development, implementation, upgrade and remediation. A very good book ! It gives a wide view on industrial network cyber security challenges which the industry is facing. The book is very easy to understand for those who are not familiar with the OT world. The chapters are in a sensible order which helps on the one hand to get the general ideas and on the other hand to get the relevant tools in order to transform the ideas into a practical approach.